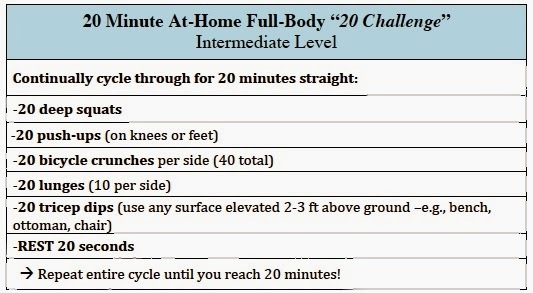 taylor made: 20-minute at-home full body "20 challenge"
Every so often, I get this realization that I'm being annoying. That's the worst feeling, right? It's that moment of clarity that you get sometimes -- "damn it, I've been so annoying lately." I'm not the only one that has these moments, right? And the worst part is, you know that if you're annoying yourself, you've GOT to be annoying other people. I had one of these realizations lately, and it came after I made an excuse. The exact excuse of that moment doesn't particularly matter, it was more about the general pattern of late -- I've been making a lot of excuses! I can't do this because of that, I can't do that because of this. I have a lot going on. I don't have time. I've had a lot on my mind. I'm really stressed right now. These become annoying when they start to add up. Yes, I'm busy, and yes, I'm tired. So is, um, just about everyone. No, it's not easy to make time for everything I'd like to do, but I can at least try before giving an excuse, right? Stop being so annoying! One of the excuses I've been making too often recently is that I don't have time to work out. Yeah, I still exercise at least a couple times a week, but I'd like to be doing more and I use my handy excuse way too often. When I really think about it though... it's kind of a silly excuse. There are 1,440 minutes per day. Can't I spare just 20 or 30 minutes of those to get some exercise in?! Especially when it's something that really improves my life?! Come on! When I caught myself making that excuse a few days ago, I corrected myself: it's not that I don't have time, I just don't have a lot of time. I do have some time! Specifically, I had about 20 minutes to spare. Well, guess how much I accomplished in those 20 minutes? A lot! This is a "20 challenge" that I created. It takes just 20 minutes, but it's guaranteed to have you sweating by the end, and probably even sore the next day! It's a very challenging 20 minutes, but remember... it's only 20 minutes! You can do anything for that long! I really encourage you to try this. No more excuses! Do you have 20 minutes before work tomorrow? 20 minutes before dinner? 20 minutes before bed? I bet you can find the time. I've done this a couple of times now, and I've been getting through it about 5.5 times each time. So yes, it's only 20 minutes, but I'm sweating and shaking by the end and this stuff adds up! It works out to over 100 squats, 100 push-ups, 100 bicycle crunches, 100 lunges and 100 tricep dips -- not bad for 20 minutes! Unsure about any of the exercises? Check out some youtube videos for proper form tips!